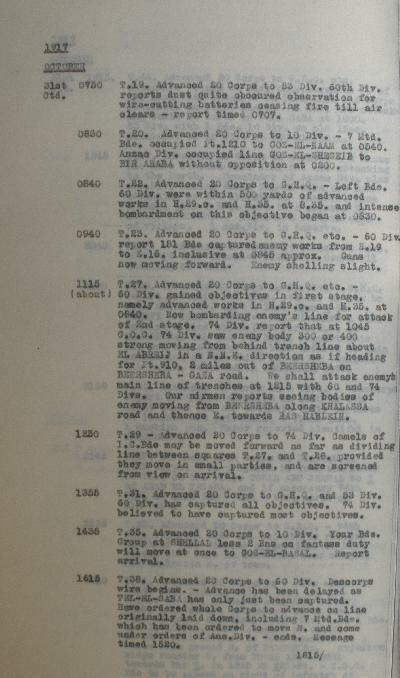 War Diary account of the 20th Corps. The follow is an extract from the 20th Corps War Diary regarding the Battle of Beersheba. 0310 - T13. Advanced 20 Corps to GHQ - Inner Infantry Brigades 60th and 74th Divisions in touch and reached line of deployment. Desultory rifle fire, slight shelling:- 53rd Division reached all required positions. 0455 - T15. Advanced 20 Corps to 10th Division - 2/4th Devons will move from Kantara to Shellal about 1 November and be at the disposal of Defences El Arish for protection of Karm, Imara and Shellal. 0600 - T16. Advanced 20 Corps to GHQ etc. - Situation report - All troops of all divisions in position according to plan without incident. Patrol 53rd Division attempted to cut telephone wires from Saba to Sheria but unable owing to rifle fire. Patrol reached point within 400 yards of railway about W.32.c. central. Country traversed is passable for all arms. 0710 - T18. Advanced 20 Corps to 74th Division. Camel Brigade report 0600 situation normal, nothing to report. Instruct Camel Brigade to report normally through you. 0750 - T19. Advanced 20 Corps to 53rd Division. 60th Division reports dust quite obscured observation for wire-cutting, batteries ceasing fire till air clears - report timed 0707. 0830 - T20. Advanced 20 Corps to 10th Division. - 7th Mounted Brigade occupied Point 1210 to Goz el Naam at 0540. Anzac Division occupied line Goz el Shegeib to Bir Araba without opposition at 0200. 0840 - T22. Advanced 20 Corps to GHQ. Left Brigade. 60th Division were within 500 yards of advanced works in H.29.c. and H.35. and intense bombardment on this objective began at 0830. 0940 - T23. Advanced 20 Corps to GHQ etc. 60th Division report 181st Brigade captured enemy works from Z.19. to Z.16. inclusive at 0845 approximately. Guns now moving forward. Enemy shelling light. 1115 (About) - T27. Advance 20 Corps to GHQ etc. 60th Division gained objectives in first stage, namely advanced works in H.29.c and H.35. at 0840. Now bombarding enemy's line for attack of 2nd stage. 74th Division report that at 1045 General Officer Commanding 74th Division saw enemy body of 300 or 400 strong moving from behind trench line about el Abreij in a North North East direction as if heading for Point 910, 2 miles out of Beersheba on Beersheba - Gaza road. We shall attack enemy's main line of trenches at 1215 with 60th and 74th Divisions. Our airmen report seeing bodies of enemy moving from Beersheba along Khalassa road and thence east towards Ras Hablein. 1230 - T29. Advanced 20 Corps to 74th Division. Camels of Imperial Camel Corps Brigade may be moved forward as far as dividing line between squares T.27 and T.28 provided they move in small parties, and are screened from view on arrival. 1355 - T31. Advanced 20 Corps to GHQ and 53rd Division. 60th Division has captured all objectives. 74th Division believed to have captured most objectives. 1435 - T35. Advanced 20 Corps to 10th Division. Your Brigade Group at Shellal less 2 Battalions on fantass duty will move at once to Goz el Basal. Report arrival. 1615 - T38. Advanced 20 Corps to 60th Division. Descorps wire begins. "Advance has been delayed as Tel el Saba has only just been captured. Have ordered whole Corps to advance on line originally laid down, including 7th Mounted Brigade, which has been ordered to move north and come under orders of Australian Mounted Division." ends. Message timed 1520. 1815 - T44. Advanced 20 Corps to GHQ etc. Situation report 60th Division concentration east of Red Line with outposts on Blue Line and Corps Cavalry Regiment on right flank. 74th Division are attacking works to north of Wadi Saba at 1900. 53rd Division with one Brigade, 10th Division on old line. Remainder of 10th Division at Goz el Basal. 1845 - T47. Advanced 20 Corps to 4 Divisions. - 2nd Anzac Brigade have reached Wadi Itmy and are attacking to the North. Remainder o f Anzac Mounted Division plus Australian Mounted Division having taken Tel el Saba are now advancing on 3rd objective. Australian Mounted Division less 2 Brigades plus 7th Mounted Brigade have been ordered to attack Beersheba. Objective western edge of village. One Australian Division in reserve. 2100 - T53. Advanced 20 Corps to 60th Division - GHQ report situation at 1800. So far as can be seen Anzac Mounted Division hold a line from "K" in Sakaty - 1040 - 960. Australian Mounted Division have one Brigade holding a line about 1200 yards south east of Beersheba. 5th and 7th Mounted Brigades support this Brigade and whole Corps has been ordered to gain possession of the third objective tonight. 4th Australian Light Horse Brigade reported in Beersheba 2050. 2128 - T54. Advanced 20 Corps to 4 Divisions. Descorps report Beersheba occupied at 1940 by 4th Light Horse Brigade and estimate their captures to include 250 prisoners, 9 field guns, and 1 machine gun. Water reported plentiful in Beersheba. 2145 - T55. Advanced 20th Corps to Deputy Assistant Quartermaster General, 20th Corps. Be prepared to feed and water 53rd Division on the ridge Towal abu Jerwal to "T" of Arab el Teiaha, and if necessary, 74th Division on line 920 - 900 - 870, north of Bir Saba. 2255 - T63. Advanced 20 Corps to GHQ. 74th Division reported 2125 all objectives reached north of Wadi Saba, no opposition. 60th Division reported 1930 fire in Beersheba near mosque. Big explosion east of town. 2210 - T56. Advanced 20 Corps to 4 Divisions etc. 266th Brigade Royal Field Artillery, Imperial Camel Corps Brigade and the 2 Battalions 55th Division hitherto attached to Smith's Group will revert to command of 53rd Division at 2400 tonight, October 31. 53rd Division less one Brigade and Imperial Camel Corps Brigade under command of the General Officer Commanding 53rd Division will advance at 0530 tomorrow to seize high ground north of Beersheba. Objective ridge running west from Towal abu Jerwal towards the "T" in Arab el Teiaha, Imperial Camel Corps Brigade to be placed on right of infantry of 53rd Division to gain touch with Desert Mounted Corps. - 10th Division will take over front from Gaza - Beersheba road south of Irgeig to Point 550 wast of El Girheir exclusive, relieving present left Brigade of 53rd by 6 a.m. tomorrow, November 1, thus freeing this Brigade of 53rd Division to follow remainder of Division. - Yeomanry Mounted Division takes over from 550 east of el Girheir through 510 on Abu Shawish road to Hiseia all inclusive by 6 a.m. November 1. Heavy artillery attached 53rd Division will revert at 6 a.m. tomorrow, November 1, to command of the General Officer Commanding Heavy Artillery Group and batteries of 96th Heavy Artillery Group will be in new positions to bombard the Kauwuka group works by 3 p.m. tomorrow, November 1st. Acknowledge. 2225 - T57. Advanced 20 Corps to 60 and 74th Divisions. 60 and 74th Divisions will be responsible for clearance of battlefield tomorrow beginning at dawn. War material to be collected, dead to be counted and buried, and enemy gun positions searched. 60th Division to be responsible for works south of Wadi Saba, 74th Division north of Wadi Saba. Both divisions to be prepared to leave this work, assemble and move at an hour's notice. 60th Division will send one Squadron Corps Cavalry Regiment into Beersheba tomorrow morning, Squadron to be at point where Fara Saba road crosses enemy works at 0600, and to gain touch with Desert Mounted Corps. Officer Commanding Signals will have motor Cyclists at same point to accompany squadron commander into Beersheba.